Generating traffic becomes much easier when you have the right approach from selecting right niche to right marketing strategy. 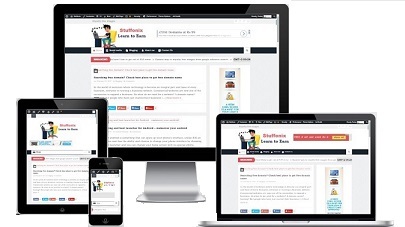 You can check our ultimate guide on How to choose blog niche. But this journey need lot of research work for not only create good content but also get good ranking to get traffic. One of the simplest and basic strategy of getting rank and traffic is SEO. According to wikipedia ‘Search engine optimization (SEO) is the process of affecting the visibility of a website or a web page in a web search engine’s unpaid results’. Means in simple words if you have article on “Best Pizza in India” and if some one who belongs to India and search about Best Pizza then your article should come in top result of Google. SEO can help you to get traffic without paying any single penny and for your information first 5 result only get 65% of click and rest millions of result get 35%. I think you will get the idea how important to get in top rank and importance of SEO in getting rank. Many people work as SEO expert and make money online by doing SEO work for websites. some time they apply some tricks and get your blog rank up in small time period and that leads to divide SEO expert in 2 side – White Hat and Black Hat. If you want your website to get rank in very small time period and get thousands of visit in one day even without having quality content then you can use black hat SEO technique. If you search in fiverr for getting rank fast then you will find many Gig but please don’t go with this strategy as once google catch you then you will be penalize and suddenly your rank fall down. Duplicate content, Keyword stuffing, invisible text, redirect user to another site or cloaking, and get link from non-relevant site are some of example of black hat SEO. Black hat SEO expert more concentrate on Google instead of thinking about what user expect. But some time this strategy helpful when you have event in your college or school and you want student to visit your event site in current month then you need traffic on urgent basis so you can apply this strategy. If after one month Google down your event site rank then also there is no effect on your event. If you want your website get rank by applying universal accepted strategy then you can go with white hat SEO. This strategy more focus on user and write for user only instead snot for Google. provide quality content with and easy to understandable. Relevant content, Well labelled images, unique title, correct spellings and proper use of keyword are some strategy of White hat SEO. This strategy take couple of month to get good rank but rank sustain for long time. If you make some changes in your content post to get Good rank means you are doing On-page SEO and if you are doing something in external site to get authority of your site which help in getting rank then you are doing off page SEO. So in this article we are providing you all on-page strategy which one should implement in order to get higher rank. You have probably heard “Content is King” and it’s actually play great role in success of your blog post. So you need to make sure whatever content you are providing relevant to your topic and authenticate. If you are not providing Good content then it leads to increase bounce of people from your blog which give negative effect in Google ranking. If you are giving your whole energy to create quality content then Google Also help you to get rank..And if I consider Google as god then a great line said by Benjamin franklin.. So if you are here to selling your writing skill as product to user then you have to design product well otherwise a Good sales man even can not sale bad product and even if they sale then next time never get same customer again. Try to provide example in support of what you are trying to say so it deliver your message more strongly. The readers should be familiar with the kind of words you use. Do not over exaggerate unnecessarily or use big words that are not easy to pronounce or understand. So what you think how it help if you use simple word? Suppose you are targeting user not specify to particular country and you are writing for general people then your user may also come from non native English speaking countries like Bhutan, Nepal, Bangladesh and Pakistan. So make sure to use very simple words that everyone can understand and even 7-8 standard student can understand. One of the most important factor Google use to rank any website is Keyword!! Keywords are just Phrases which user use to search particular information on Google and on basis on keyword Google find best suitable content for user. You can use keyword research tools to find low competitive and high volume keyword for your blog. Low competitive help you to get your keyword rank easily and high volume help you to get more traffic for particular keyword. Most of on page SEO expert suggest to use Long tail keywords in their post so chance of getting traffic for from such keywords is easy that’s why we have written post on How to search long tail keywords. you can use this technique to get better result. You can also use keyword in your article and even if you use synonym of keyword then also it help you to get benefit in ranking. Note – Please make sure to not overuse any keyword otherwise your post will be banned and you loose your cranking also. so before post publish any post please check free online density tools . The title or the headline of your content should be of course relevant to your service, but most importantly it should be eye catching. It should be appealing enough to grab the attention of your target audiences. Note– Please also make sure your title size should not be greater than 75 character. If you are choosing quality images for your blog then it may look good but when it comes to ranking Google check Alt tag and description of your image. Google crawler not able to read images so they use tags to understand what image all about. so make sure add tags properly. 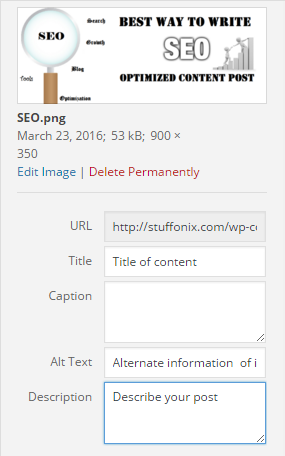 For more better result please add keywords in alt tag and file name of your images. If you want to know more about image SEO then please read our guide on image SEO optimization techniques. A written material may be monotonous at times so try combining it with good quality photos. If you wish to educate your readers on a certain topic, the best way is to provide them with a tutorial video. What will you do when you open any site for searching something and take more than 30-40 second to get open. Surely you get angry and close that site..
Today people are in so much hurry and they want site to open in less than 5-6 second so make sure your site take less time to load. You can use Pingdom and GTmatrix online tools to check speed of your site and if it less then find optimization technique to load your page fast. Google give more values to keywords which present in heading tags like H1, H2,H3 and so on. So make sure use H1 tags for your title of post and H2 tag for subheading of post. So choose best keyword for your post and make sure to use them in headings first. Google crawler move from one page to another page through links on page. So make sure that your current post link with relevant post of your blog..we called this technique internal linking. Like example if you are writing about Fiverr guide then you can give link to user about you should also know Fiverr best gig idea. URL structure is important part of on-page SEO. While setup WordPress or any type of blogs people usually not change existing URL structure . And when some one search or open your post it looks like. Note – Please also make sure your URL size should not greater than 90 character for better result. Now a days more than 30-40% of user on my website visit through mobile device and probably 3-4% user use tablet to visit. By reading above data you must understand the value of mobile platform so make sure your website run on each platform smoothly otherwise you would losing a big part of user base. You can use responsivedesignchecker.com, mobiletest.me and ami.responsivedesign.is to test whether your site is responsive or not. Make sure your site will be easily crawled by Google, yahoo and other search engine so please create site map on your site and submit site map to each search engine. Site map is just a list of pages your site contain and tell Google and other search engines about the organization of your site content. If you are using WordPress as blogging platform then you can read how to create site map using yoast SEO plugin and read how to submit site to Google search engine. Even if you site is not crawling by Google then you can read our post why google bot not crawling my site and probably find solution. What happen when you visit any website and click on available links in page that leads you to Page not found error? Actually same thing may happen with user who visit your site and it create a negative image of your site. Not only user prospective but 404 error also monitor by Google and if you have many page not found error then your rank could affect so make sure to point each link to correct address. You can check our guide of how to find 404 page not found error and get rid of same. There are various tools by which you can track the number of audiences driven on your blog in a day. Use these techniques wisely to figure out if you are able to generate productive outcome or not. I recommend to use Google analytics tool (Free) to analyse your visitor information. Google analytics will help you to find which keyword user use to land on my website, which country user visit more, most famous landing page and many more. Hope you like this blog post and try to apply all above on-page SEO techniques to get rank of your site. Try incorporating proper keywords in your content to let it stand out on the internet.